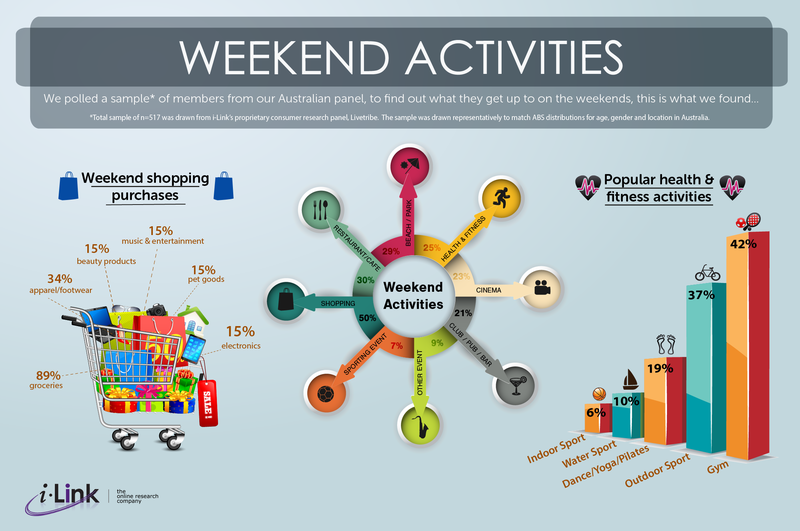 The most popular weekend activity was shopping, which accounted for half of the responses we collected. Stocking up on groceries was the most common reason for a weekend shopping trip at 89%, followed next by shopping for clothing and footwear (34%). We're fortunate to enjoy great weather in Australia and it appears our panellists don't take it for granted. Heading to the beach or a local park was also a popular weekend pastime (29%), with activities such as swimming (21%), relaxation (34%) and catching up with friends and family (17%) being the most popular pursuits once there. Keeping active is another common weekend pastime, with a quarter of respondents indicating that various health and fitness activities form part of their weekend schedule, of these, going to the gym (42%), general outdoor sports (37%) and yoga, dance or pilates (19%) were most popular. At the other end of the spectrum, but just as popular, were the more passive activities of going to a restaurant or cafe (30%), and going to a club, pub or bar [21%], indicating that Australia's known appreciation of socialising is showing no signs of abating. Total sample of n=517 was drawn from i-Link's proprietary consumer research panel, LiveTribe. The sample was drawn representatively to match ABS distributions for age, gender and location in Australia.